How many times did your mother say: “sit up straight and don’t slouch.” At the time you heard those words you were likely to comply, at least for a short time. 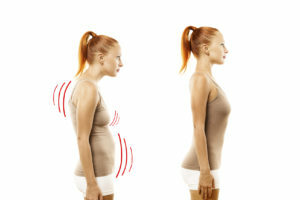 However once you left that environment you continued to allow your body to slouch or slump because your connective tissue, muscles and bones established a pattern resulting in poor posture. Have you ever tried to emulate what you believe to be good posture? Almost everyone can do it…..for a short period of time. But eventually your muscle memory and soft-tissue patterns take over and your body returns to the position you know as your posture. People in all walks of life experience poor posture. Whether you work at a desk, build houses for a living, or as a dancer or athlete, you may find fault with your posture. Are there remedies to improve posture and re-train your muscles and bones to reflect proper posture? In a word, yes. The art of Rolfing was founded by Dr. Ida Rolf, Ph.D over 5 decades ago. A Rolfer conducts a Rolfing massage (specialized soft-tissue manipulations) focuses on effecting structural changes in the human body. The treatment concentrates on the myofascial system that influences the skeletal structure. Rolfing releases deep soft-tissue pattern formations effecting skeletal positioning. In order to release the fixations in your deep tissue, a series of Rolfing sessions will help your body to regroup and enhance your alignment. Rolfing begins with superficial tissues and with each session goes deeper into the problem areas to ultimately release the long-held tissue that has effected alignment and balance. Rolfing is applied in a series of sessions (commonly 10) because it is a process of change and long lasting change does not occur with just one session. Included in a series of Rolfing sessions is hands-on manipulation of deep soft-tissue strain patterns, movement and postural analysis and client education. The overall benefits of Rolfing are many. The ability to sit taller and stand straighter, reduction of aches and pains, increased flexibility, more fluid movements and even breathing easier are but a few. Athletes, musicians and dancers all put an enormous strain on their bodies for extended periods of time. Many use Rolfing in place of massage on an ongoing basis to ensure they stay fluid, improve performance and correct chronic injuries due to overuse. If you want to enhance your quality of life, contact Bob Alonzi, a Certified Advanced Rolfer in Los Angeles, today. Rolfing therapy is not just for those currently ailing but also for anyone who wants to improve their performance (athletes, dancers) or improve posture. Bob has worked with people from all walks of life for 26 years and has seen countless successes He looks forward to helping you with your injury or trauma, or in helping you attain better posture and balance.